Burgos López, Campo Ricardo. 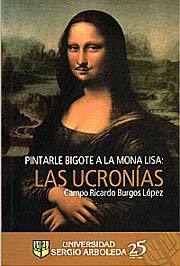 Pintarle bigote a la Mona Lisa: Las ucronías . Universidad Sergio Arboleda 2009. Summary: Divided intro three parts, the first discussing what uchronia/alternate history is, the second examining several example works, and the third surveying works in Colombian literature. Published: Universidad Sergio Arboleda 2009 (9789588350325).